In 10-inch skillet, heat 1 tablespoon of the oil over medium heat. Season steak with grill seasoning. Add to skillet; cook 9 to 11 minutes, turning once, until meat thermometer inserted in center reads 135°F (medium-rare) or to desired doneness. Remove to cutting board, and let stand 5 minutes. Cut steak into 1/4-inch slices. Meanwhile, add shallot to same skillet; cook over medium heat 1 minute, stirring constantly. Reduce heat to low; add balsamic vinegar, red wine vinegar, remaining 2 tablespoons olive oil and the honey; stir constantly 1 to 2 minutes or until shallots are coated and vinegar mixture is blended. Remove from heat. 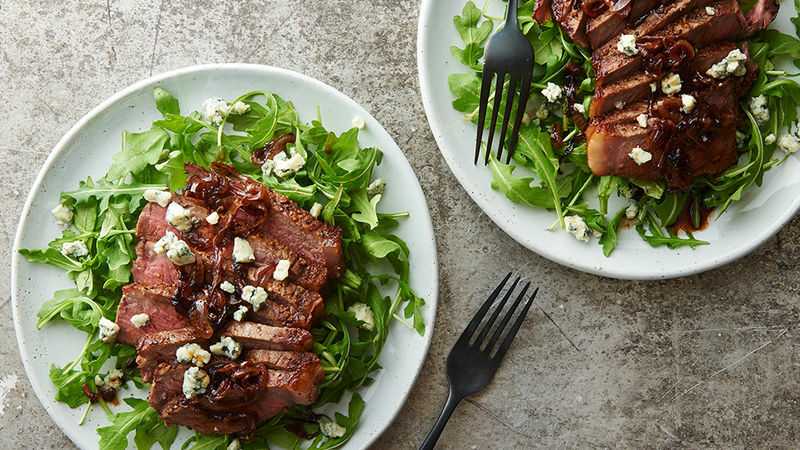 Place arugula on serving plate; top with steak slices, shallots and blue cheese. Pair this steak skillet with a side of potatoes and red wine for a cozy dinner for two. Montreal steak grill seasoning is readily available in the spice aisle of your grocery store. If you just want to use salt and pepper, substitute 1/4 teaspoon of salt and 1/4 teaspoon of ground pepper for the seasoning blend.